The theme for the second tag swap over on Vix's facebook tag swap group is Enchanted. Here are my offerings, about to be posted off! We had to make a set of 8. Mine are all variations on the same theme! 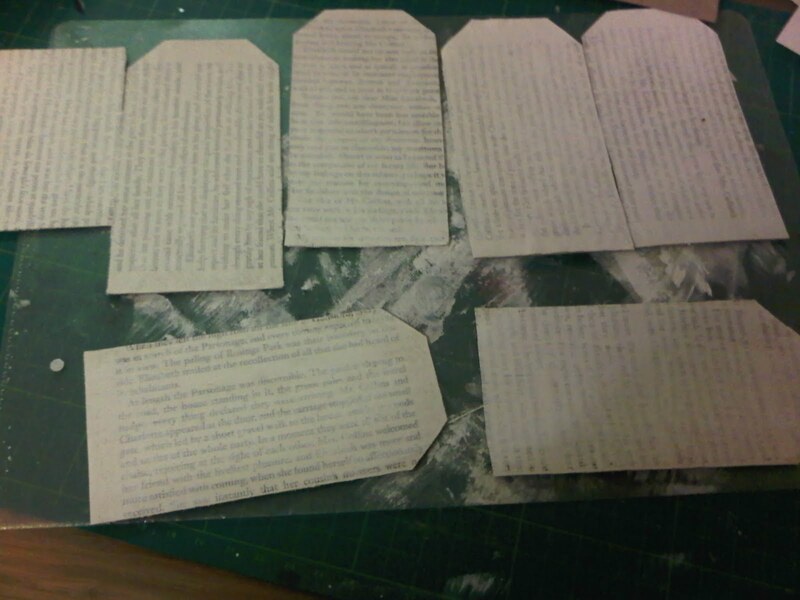 I started by sticking pages from a book to my card bases and then lightly gessoing them so that the text still showed through. I made a bit of a mess don't think I'll ever be a tidy crafter!!! 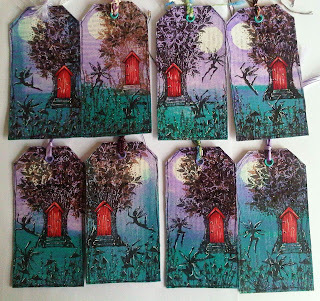 I then masked off a moon and painted each tag with some watered down Claudine Hellmuth Studio semi-gloss acrylic paints in Purple Palette and Classic Teal. 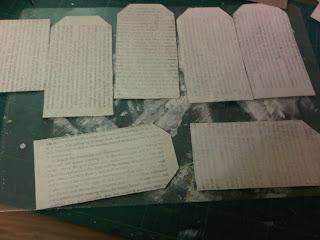 Next the difficult bit.....waiting for them to dry......didn't take too long. I then used a gorgeous tree stamp from Lavinia which comes as the tree stump with door in and a dinky set of leaves for you to build the tree up as you want it. I stamped the first one in brown Versafine but it was a bit light so I went for a black Versafine base with a few added leaves in the brown for the other 7 tags. Can you spot the odd brown one out? Add a touch of black stickles and white gel pen (what else?) a doodled border, eyelet and ribbon, and they were ready to go. Hope the ladies in the swap like them! 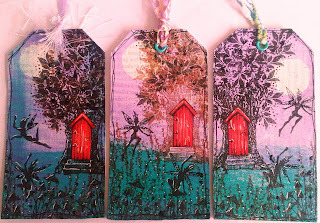 I'm entering these tags in the challenge at the new Crafts and Me challenge blog, where the theme is Faeries or Wings. I've got both on here!! It's also my entry for the new Sir Stampalot Challenge blog, where the prize is an amazing one- a Cricut!!! The there there is fantasy. Fabulous tags, Lisa! I love those stamps! Thanks so much for sharing with us at the sir Stampalot challenge, and good luck! 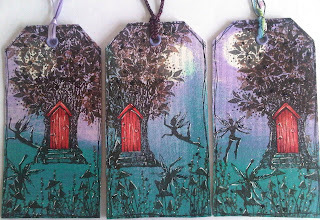 Excellent work, you have definitely captured the fantasy feel with these beautiful tags. Thanks so much for playing along in our first challenge at Sir stampalot. Thank you for joining us at crafts and me and good luck. 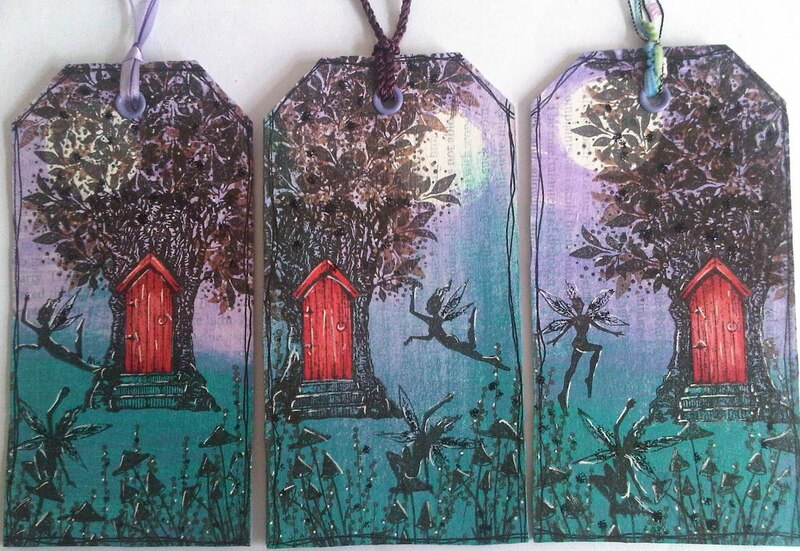 What gorgeous tags! 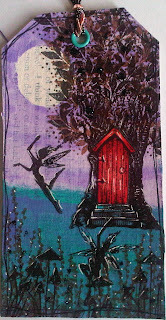 I am thrilled you could join us on our first challenge at Crafts and Me. Hope to see you again next time. Great tags lots of work there! Thankyou for joining us at our 1st Crafts and me challenge, good luck. Oh my these are wonderful tags I love them thank you so much for joining our challenge at Sir Stampalot. Wow these are fabulous.Thanx for joining Crafts and me for our very 1st challenge. Truly magical. Thanks for joining the first Sir Stampalot challenge, good luck. wow these are fantastic!! I love them. Three Goddesses, Two challenges, One image! I won and I'm in Craft Stamper!! !